You might have understood it now, at Gallinée, we don’t like “doing like others”. As you might know, we have a new product on our website, the Face Vinegar, a soothing toner for sensitive skin. Yes, you read it correctly. Soothing and vinegar can be part of the same sentence! Today Lea comes back to write an article about the scientific results that make our Face Vinegar not just a simple toner. Here, Léa, the “Marketing Manager” of Gallinée who deals among others with the product development of the brand! You may have already read me in the article on the miraculous manufacture of our soaps without soap, if this is not the case, I invite you to read it here, it is worth it ;). This is our new product and we love it just as much as its big brothers and sisters. we are very proud of it because its surprising properties (purifying and soothing at the same time) are scientifically proven. Let me explain: in this article I told you how to create a product. In line 10, paragraph 4, subparagraph 2, I explained that when a product comes out on the market, it has undergone a battery of tests (stability test to see if the formula does not split for example, microbiology test, to be sure that your cream does not turn into cheese under the effect of bacteria, hydration test to measure the performance of the product and a whole bunch of other tests). You’ll understand, our new product, the Face Vinegar, has also past controls. The good news that I share with you today is that there were excellent! 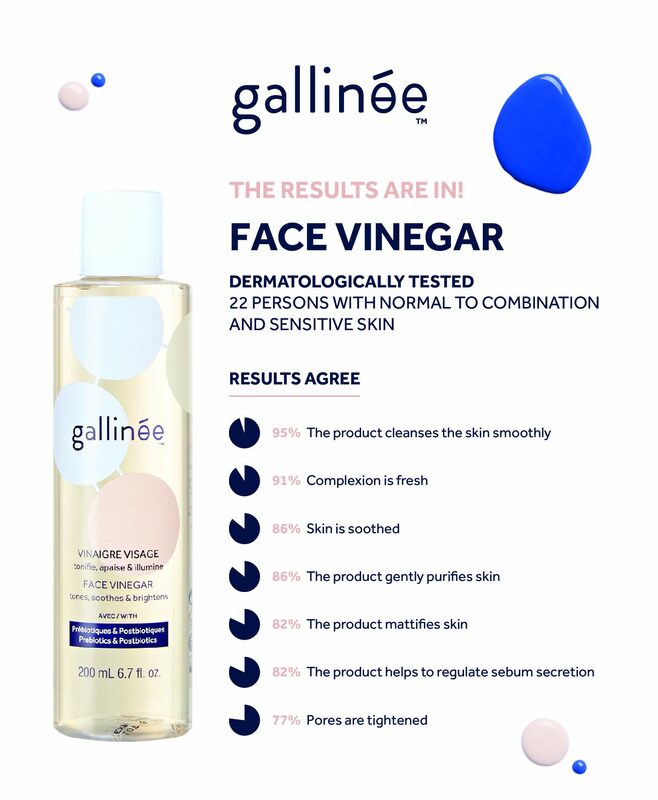 All our products are dermatologically tested, which means that for about 28 days, people (at least 20) have tested Gallinée products on their skin. For our last launch, I made the choice to test the products on people with normal to oily AND sensitive skin. The importance lies in the “and”. All tested people had sensitive skin in addition to being normal to oily. Why this choice? Why not have privileged normal skin since they represent the majority of skins? Gallinée is primarily intended for sensitive skin, if a product is tolerated by sensitive skin it is also tolerated by normal skin. The product received an excellent 100% skin tolerance rating (it means that it did not cause any reaction, tingling or irritation to the tested subjects). People tested were aged between 18 and 71 years, roughly speaking, everyone tolerates our product, and that’s good! Do you know how we test a product? The testers are invited to go to two dermatological visits, at the beginning and the end of the study. A dermatologist will measure the effects of the product on their skin using a patch to measure hydration for example. The testers will, therefore, fill in a questionnaire and judge whether they agree or disagree with the statements indicated in the questionnaire. If you have any question regarding the product’s development, please do not hesitate to contact me at info@gallinee.com with the subject “I want to know everything about your wonderful products”.